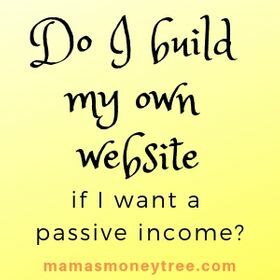 Before you even start anything online, it is worthwhile to give some thought to this question: do I build my own website, if my purpose is to earn a passive income and acquire financial freedom? Because if you do not convince yourself of the importance of owning a website right from the start, then when things go wrong, or when you get stuck, or whatever you do don’t seem to be working, you would likely begin to question whether this was the right path to have taken. So in this post we are going to dwell on why it is so crucial to have your own website in the online world. Why do I build my own website if I want to succeed online? Unless you are running a restaurant in a small town, and you are only interested in serving up a hot, piping, nutritious meal to your local villagers, then you may get away with not having a website. Even then, in the small town, a website will certainly make an exciting addition to your business. For example, you could update your ‘soup of the day’, or ‘catch of the day’, so your customers can buzz about it and anticipate the lunch that is to come. You could also capture their feedback using an iPad right after their meals, so it shows you value them, rather than having a dissatisfied customer simply walking out of the restaurant and losing him. Collated feedback could also drive your marketing directions, and show you whether you need to work on the menu, quality of food, food presentation, waiters’ service, or furniture in the restaurant, cleanliness, etc. What more, if you intend to let your business drive a passive income, you definitely need a ‘storefront’, albeit an online one, that people, your loyal customers, can keep coming back to. A brick and mortar business is great and has its place, along with its limitations. But complemented with a website, the sky becomes the limit. Owning a website is like owning a property, a piece of land, a house, in the internet world. It forms the basis of your existence and influence. Without a website, nobody can find you except the customers who already know you. When you own a website, whatever work you put into it stays, and builds upon all your past effort. Start small, and build it up slowly. It does not get lost in the vast and endless world of the internet, like how social sharing, forum sharing, and many other marketing strategies require constant posting, tweeting, etc. to keep the outreach going. Of course these other marketing strategies will help your business, but the core of it is still your website. You can work on search engine optimisation. If done properly, the search engines will reward you with consistent quality traffic because your visitors’ needs and what you are offering are the perfect match. When that happens, your visitors will be the ones doing the social sharing for your business, because what you offer is legitimately helpful. And you will be on your way to a sustainable passive income. With your own website, the branding aspect of your business can be made very prominent. Through your site logo, tagline, and the engagement with your visitors, etc. It forms the first impression, and helps your new visitors to make the associations that you would like your business to be linked with, be it environmental responsibility, speed and efficiency in delivering your services, etc. The message can be sent across strongly at one glance of your homepage. And it makes you unique. Without a website, there is nowhere to establish your brand, unless you are already an influencer on some social media platforms. But even then, most, if not all, influencers do have their own websites to begin with, and to build upon. When you own a website, the tools that you would set up alongside it would help you tremendously by pointing you in the right direction for your marketing efforts. Google Analytics gives you tons of information, from which you can base your analysis: which countries are your readers from, did they find you through search engines or social media, which pages do they frequent, how long do your visitors spend on your pages, from which pages do they exit your website, etc. Google Search Console takes things to another level, by analysing the keywords through which your visitors found your website. With the technologies in place, you have a bird’s eye view of what exactly is going on in your business, and can make informed choices, to take appropriate actions. You are the website owner, you have the complete say in how things are run. And you can adapt to changes and trends as they make their way through the fast-changing online world. You can choose to dabble in affiliate marketing, or e-commerce, or drop-shipping. You can make your own handicraft or jewelry and sell them online. You can use your website or set up a new one for some charity cause that lands itself into your life. There are a thousand and one things you can do with your website, because you own it. I hope you are now convinced of the answer to the question ‘Do I build my own website?’. You just need the right tools and resources, and to be pointed in the right direction by people who had succeeded in making their passive income. You may feel overwhelmed or frustrated at times, but remember, it’s those who never give up, those who dare to dream, and those who never stop learning, who will succeed. Don’t let anyone tell you otherwise.